Home / Articles & Papers / Surface Pretreatment: A Vital Prerequisite for Successful Copper Plating! Surface Pretreatment: A Vital Prerequisite for Successful Copper Plating! ■ Figure 1: Electrolytic Copper Plating Process. CupraPro S8 is a new acid cleaning pretreatment which is designed to offer high flexibility for the substrates to be pretreated. Pretreatment by acid cleaners is a vital process step in order to grant successful copper plating within the PCB production. The described pretreatment is intended for multiple use, i.e. for MLB as well as HDI applications in hoist type equipment. This fact offers a tremendous flexibility to PCB manufacturers. 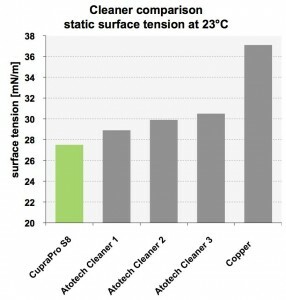 This article describes a novel high performance pretreatment which cleans and activates the electroless copper layer on a biodegradable basis without harming the dry film. In order to successfully run through the entire electrolytic copper plating process, more steps than only the electrolytic copper deposition itself has to be considered in order to receive a good result. A typical process flow for electrolytic copper plating includes the following steps seen in figure 1. The first step consists of the cleaning sequence. It is required in order to prepare the substrate surface for metal deposition, i.e. in detail to ensure copper adhesion and uniformity, removing impurities from the surface such as finger prints or resist residues. Thus it provides overall wetting of the finest structures for all following steps. The cleaning sequence is followed by the optional etch cleaner process step which creates a defined micro-roughened surface for optimum copper to copper adhesion. After that the acid dip conditions the substrate and finally copper can be deposited within the copper plating step. The proceeding reduction in lines and spaces within the PCB industry requires improved pre-treatment for cleaning and wetting of all structures to ensure void free copper deposition. The acidic pretreatment process prior to pattern plating includes beside cleaning an wetting two basic functions. The desoxidation of copper surface and neutralisation of e.g. dry film developer residues. Main component of cleaners are surface active substances. Ionic, amphoteric or non-ionic surfactants such as alkoxylated fatty alcohols can be used. They have a hydrophilic group – its water soluble head – and a hydrophobic group, i.e. their tail which is not water soluble. Surfactants diffuse in water and adsorb at interfaces between air and water. Surfactant micelles help to clean surfaces from hydrophobic residues if they have stronger adsorption forces than the surface residue to the panel surface: The additives used in cleaner formulation should result in a medium-low foaming acid cleaner providing a high stability of formulation and concentrate. ■ Figure 3: Advanced designs need enhanced pre-treatment. 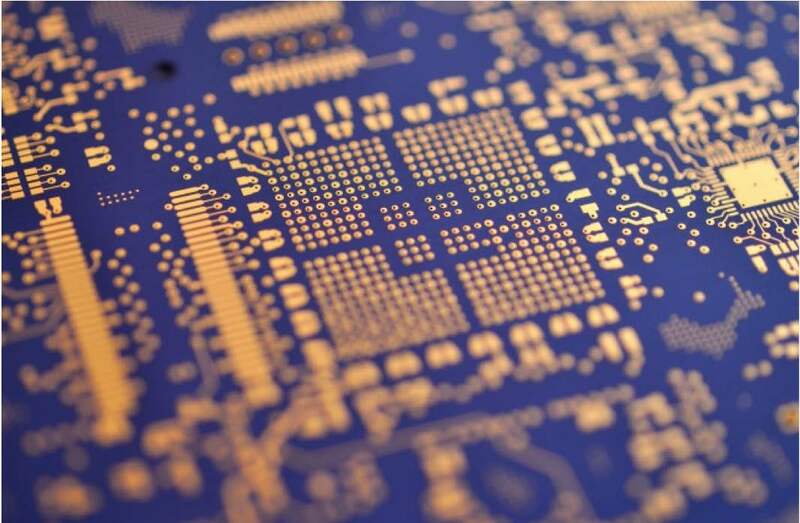 Process reliability has become a major factor for PCB manufacturers whilst board designs are becoming ever smaller, finer, sophisticated and delicate. By that the probability of voids occurring during the production process and thus the scrap rate becomes higher than ever before. Hence nowadays it is even more vital to have process security granting void free deposits. This requirement is supported if the pretreatment of a substrate is effected correctly. Unfortunately this topic does not always obtain reasonable attention by PCB manufacturers, which can be one of the reasons why downstream electrolytic processes lead to defective results. Misleadingly the plating process itself is blamed for those defects, although the root cause in the majority of cases lies in the insufficient pretreatment of the substrate. With the appropriate cleaning, scrap rates may be reduced. A good pretreatment done with the optimum acid cleaner will set the course for a smooth process flow of all downstream process steps. Most important for manufacturers is that pretreatment can be done in a rapid and reliable manner, without leaving residues which cause voids in the copper deposit. For sufficient cleaning it is vital to grant a comprehensive wettability of the board including smallest vias. This ensures the activation of the electroless copper layer without leaving out any geometry which is the current market requirement. ■ Figure 4: Typical foaming behaviour of cleaner – foam collapses quickly. Therefore the new developed acid cleaner is well suited for MLB, Automotive as well as HDI applications. The multiple applicability is another benefit for manufacturers who produce many products, as they need only one cleaner. Possible contaminations can be caused by fingerprints through temporary storage of the boards. The touched parts show a greasy film which by all means has to be removed before taking further steps within the copper plating process. Otherwise a proper copper deposition will be inhibited. Another inhibitor can be an oxide layer when the boards were exposed a certain period of time to the ambient air. The reaction with the air oxygen immediately causes a passivation of the sensitive electroless copper layer. The new cleaner should fulfil the requirement to give fast wetting even in complicated structures, especially in through holes. It should be flexibly applicable without any compromise. Apart from excellent cleaning, fast, reliable and good wetting without leaving any air bubbles in the holes is one of the requirements. Many of the conventional cleaners have problems fulfilling this requirement. As the EU is demanding biodegradability and compliance to certain norms, biodegradability and also minimum waste water became also important. The challenge was to develop a green cleaner which reliably gives wetting and cleaning to finest designs, reaching all holes, lines and spaces for panel and pattern plating applications. On the one hand the cleaning effect had to be very good and at the same time foaming has to be controlled. The new cleaner should have more and better benefits than the existing ones in order to complete the acid copper plating process and increase the plated product quality. During its development, it was benchmarked in lab scale tests against standard Atotech acid cleaners as well as against competitor cleaners and has shown excellent results. 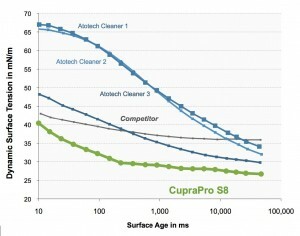 ■ Figure 5: Comparison of finger print removal effect of CupraPro S8 and other conventional cleaners. An R&D project had been started to develop an acid cleaner with improved performance compared to the existing products in the market whilst also meeting the new regulations in the European Union. The used surfactants have to be biodegradable based on European legislation according regulation (EC) No 648/2004. ■ Figure 6: Static surface tension comparison. Initial screening of surfactants took into account the water break characteristics, the capability to remove finger print marks from a copper surface as well as the foaming ability. Out of the possible replacements surfactants have been chosen which also have the lowest surface tension of 27.1 mN/m. The new acid cleaner has been formulated using this biodegradable surfactants in compliance with the EU norms. The first tests have been made in the Berlin Tech Centre to compare directly the new product with existing products under same conditions. The test of capability to remove finger prints from surfaces has successfully been passed. The test was made on a hull cell foil which had been marked with different finger prints and then plated for 20 minutes at 1.5 A/dm. in standard copper electrolyte. Comparison was made with the cleaners after cleaning for 5 minutes. The new cleaner was tested at different temperatures finding a broad process window with excellent cleaning performance. Within upscaling tests series at a Tech Centre in Guangzhou/ China, the new cleaner has been compared to his predecessor. The results in this up-scaling have shown that the new cleaner is at least equivalent to the former cleaner in terms of fingerprint. The surface tension is one of the important characteristic properties of a cleaner. The developed acid cleaner – CupraPro S8 – has been benchmarked in lab scale tests against standard in-house acid cleaners as well as against competitor cleaners. The results of the new cleaner were excellent as it is shown in the graphic below. ■ Figure 7: Dynamic surface tension comparison. The described static surface tension or interfacial tension is the time-independent value of the surface tension within the thermodynamic equilibrium in contrast to the dynamic surface tension which is related to a certain surface age. The reason for the necessity of both measurements is the fact that detergents cause a reduction of the surface tension due to their adsorption on the phase boundary. 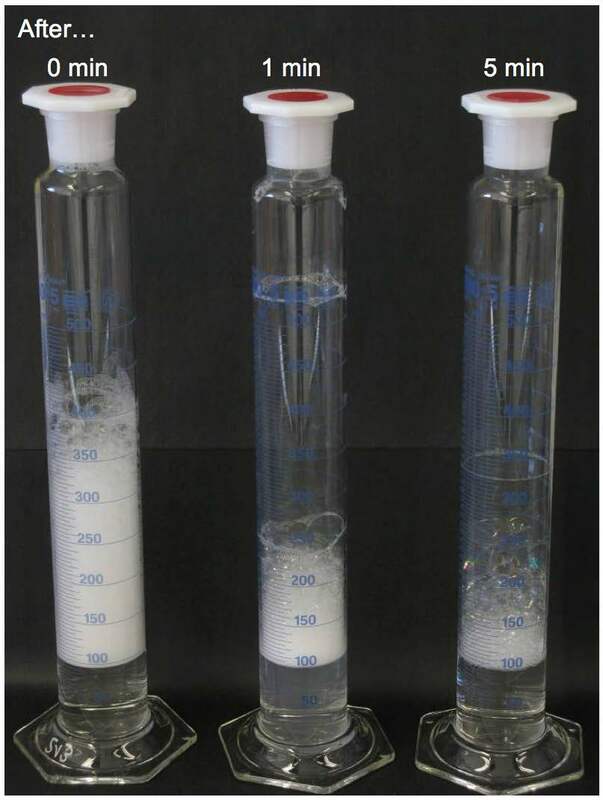 After a certain period of time, a thermodynamic equilibrium between surface concentration of the surfactant and their concentration in the volume phase occurs. The static surface tension thus is the value measured in that equilibrium state. In contrast to that the dynamic surface tension changes during the time elapsed and thus gives a better indication of the actual wetting speed of a substance. • The analytical data indicates that the replenishment procedure by measuring the total acid concentration works fine. • The low static surface tension could be controlled stable during production. • The dynamic surface tension performance is slightly reduced over one month production. Nevertheless after less than 10 seconds the surface tension becomes almost independent from bath age. Subsequently after developing the new cleaner, a qualification could be successfully completed at a customer in the UK. During one month of production, several properties of the cleaner have been evaluated on different test panels as well as on production panels. The new cleaner proved its excellent results compared to the European standard predecessor. The qualification of the cleaner has shown that there are no performance problems with the new cleaner under production conditions. It demonstrated that it is equivalent or better than the established predecessor while fulfilling all European legislations. The customer was very satisfied with the cleaner performance in production and successfully uses the new cleaner since then. By that the development phase was successfully finalised. 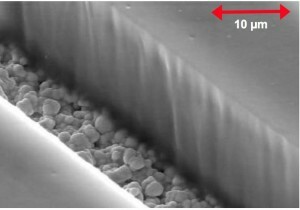 ■ Figure 8: SEM picture of dry film after cleaning with CupraPro S8 shows smooth treatment of dry film resist and excellent removal of residues. No sign of beginning dry film delamination. CupraPro S8 has shown superior or at least equivalent results in all tests so far to the existing cleaners however with the significant difference that the new process is compliant with European legislation. The developed cleaner shows optimum performance if used in vertical hoist type equipment. All the positive attributes such as extraordinarily good cleaning performance and fast wetting are adjusted for vertical hoist type equipment. chemical environment. With the developed cleaner we go one step further in this direction. It is biodegradable and fully compliant to European legislation. Thus it is compliant with international environmental laws and norms. On top of that its use leads to cost reductions regarding recycling and refeeding to the ecological circular flow. Through the positive wetting and cleaning attributes, the use of the mentioned cleaner significantly reduces drag out and thus minimizes waste water. It also reduces bound capital costs caused by high stock inventory as a manufacturer can use this universally applicable cleaner for many applications. Hence PCB manufacturers do not need separate cleaners for each type of product. The developed cleaner is the solution for many types of application. • CupraPro S8 demonstrated better cleaning performance prior to copper plating in terms of removal of finger prints, oxide layer and other residues. • During the plating process the dry film side walls were well wetted. No voids by air bubbles even in high aspect ratio through holes could be detected. No sign of any dry film lift-off or delamination was found, giving no risk of undercut. • Very fast wetting speed, proven by dynamic surface tension measurements. Through holes and micro vias wetting is excellent. • Even with one month old CupraPro S8, the wetting of blind micro vias showed no voids caused by poor wetting, also no skip plating of blind micro vias was observed. • Green, biodegradable cleaner which is compliant with European legislation according regulation (EC) No 648/2004. • Cost savings through reduced drag out and thus minimized waste water. This optimum combination of benefits grants a reliable surface preparation of all kinds of substrates for subsequent plating processes. 2. Kanani, Nasser (2009): Electroplating, Basic Principles, Processes and Practice. 3. Manahan, Stanley E. (2013): Fundamentals of Environmental and Toxicological Chemistry – Sustainable Science. Apart from her study background in Industrial Engineering, Ramona S. Mertens has been working in- and outside Germany for several renowned global players. She attained professional experience within the steel, photovoltaics and industrial automation fields as Marketing, Project and Product Manager before she joined Atotech’s Product Management for Panel and Pattern Plating. Dr. Eckart Klusmann studied Chemistry at the Heinrich-Heine-University in Düsseldorf. He received his PhD in Physical Chemistry. After his thesis he started working with Atotech in 1997 developing a PECVD process for metallization of polymeric dielectrics. He changed to the business unit for electrolytic plating processes for PCBs and worked as manager for nickel and gold plating. Currently he is working for R&D in this business unit focusing on cleaner development. Henning Hübner studied Industrial Engineering at Technische Universität in Berlin, majoring in Chemical Engineering. Starting in 2007 he gained a wide-spread knowledge and expericence regarding electroplating processes within Atotech in an internationally focussed environment. As an expert in the Panel and Pattern Plating field, in 2013 he was promoted as Global Product Manager.